This section will be new for 2017. It will pull together the information on the Twincam Engine currently contained in other sections, with new information on the history of the design and development of the engine, the change points and the serial numbers used. IGNORE WHAT’S ON HERE AT THE MOMENT AS I’M JUST PLAYING ABOUT!! This section looks at the Lotus Twincam engine, providing a history, change point summary, application and specification for the original engines. Tuning the Lotus Twincam Engine. 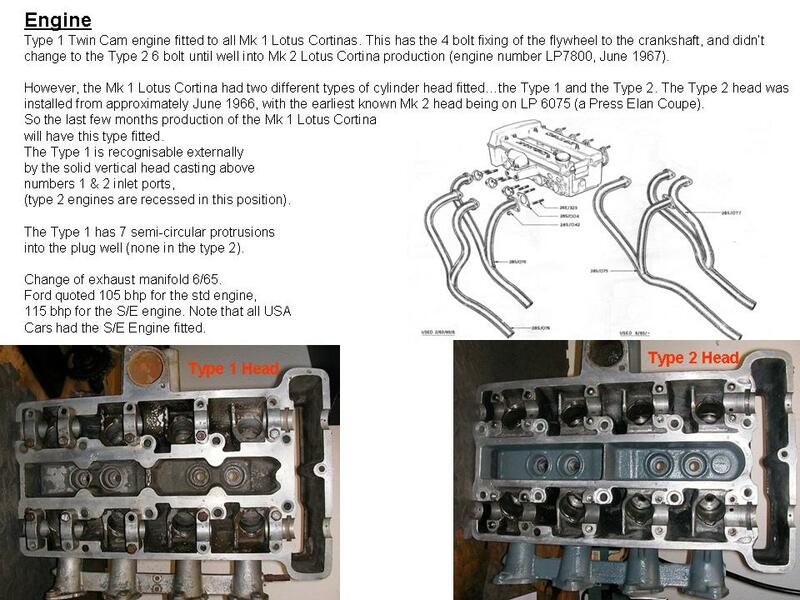 Note that this section is orientated to the Lotus Twincam in Lotus Cortinas, however, consideration is given to the engine as fitted into Elans, Sevens and Twincam Escorts to provide further context. This section does not go into detail where that is already covered by Miles Wilkins’ superb book, but presents more of a general overview for the engine as a whole, with more detail specifically for the Lotus Cortina, and where such detail is not included in the book. A replacement engine for the Elite’s Coventry Climax ‘fire pump’ engine was required, and early in 1961, Colin Chapman decided that a modified head fitted to a standard production short engine would be the way forward. 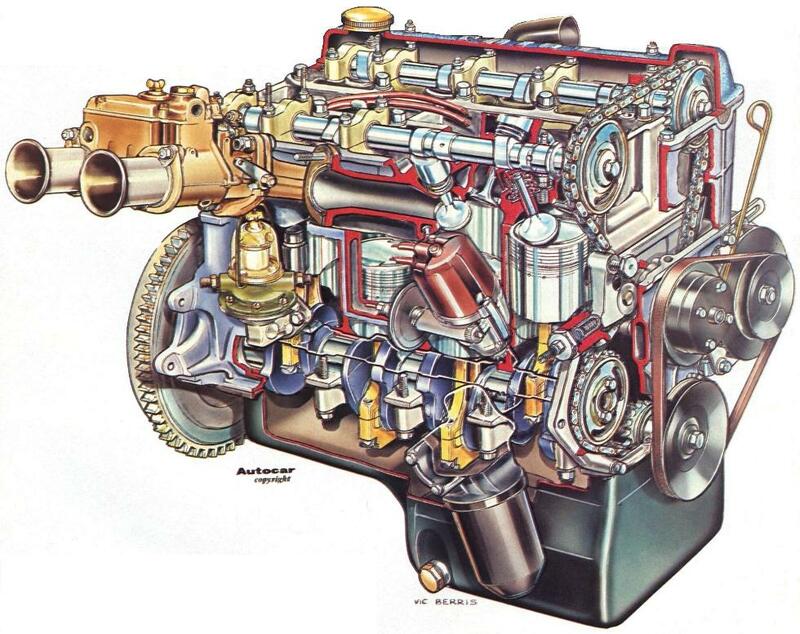 The ‘A’ Series BMC engine was considered but rejected on the basis that there wasn’t a long term ‘evolution’ plan for the engine. Chapman had a contact at Ford, Ford’s chief public relations man Walter Hayes. They had met when Hayes was the editor of the Sunday Dispatch, and had contracted Chapman to write a motoring column. After a few meetings Chapman settled on the 105E and derivative short motor, initially in it’s 1340 cc 3 bearing form. Harry Munday, ex-chief designer from Coventry Climax, was contracted to come up with the initial design. He was famously offered a lump sum (£1000) or a per-unit-made payment of £1. He felt that not many more than 1000 units would be made, so took the lump sum. In the end, 34,000 Twincam engines were made! Richard Ansdale was a transmission engineer at Thorneycroft, and had known Chapman since 1956. He was contracted to fully flesh out the design into working drawings from which a head could be cast and machined, as well as designing the front covers, water pump and cam cover. He was apparently paid ‘a pittance’, but did the work as a enthusiast of the Lotus enterprise. Work now transferred in house to Steve Sanville, who worked in the engine shop alongside Graham Hill. Steve was tasked with turning the engine into reality, and as foreman, he had Bob Dance and Neil Francis to help develop the engine. Work started in September 1961 with Bob Dance evaluating the 109E engine, and by the end of October, the first Lotus Twincam engine was up and running, with front cover and Twincam head cast by Birmide. Over the coming few weeks three engines were built, and power output was increased from 85 bhp to just over 90bhp, from the 1100cc short engine. 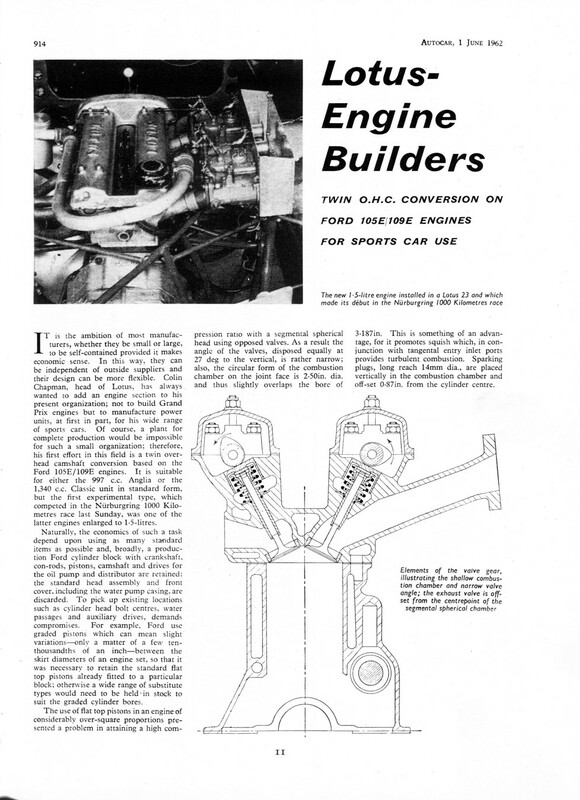 On January 18th 1962 an ‘engine development’ vehicle was prepared. This was a left hand drive Anglia bought from the Belgian Embassy, and registered 335 AXY. Left hand drive was required as the master cylinders required the room now occupied by the Weber carburettors. Bob Dance and Steve Sanville fitted a 4.1:1 differential, upgraded the suspension an popped in a 1477 cc version of the Twincam, and on the first weekend of February 1962, the car was driven over 400 miles without problem. Mike Costin was the Technical Director at this time, not leaving Lotus until the end of 1962 when he joined Keith Duckworth to form Cosworth. Keith had set up his own company in 1958 after a short stint at Lotus as a transmission engineer. Mike was involved for a short time in refining the cylider head design, with Harry Weslake in Rye, Sussex. The Anglia did sterling service, clocking up some 20,000 miles testing out the Twincam engine. On one occasion, Steve Sanville drove the car down to Bologna, Italy, and back to get the weber carburetors evaluated! J.A. Prestwich (JAP) of Tottenham, North london, were selected as the company to build the engines, as Lotus just didn’t have the facilities for such an undertaking. In early May 1962, Ford announced their new 1500cc 116E block with 5 bearing crankshaft, and Colin Chapman, Steve Sanville and John Standen (chief buyer) popped over to Ford Aveley to acquire one of the blocks. By 14th May, the first 5 bearing Twincam was running. A spare was built, and a week later, Bob Dance took a Lotus 23 to the Nuburgring for racing on Sunday 26th May. He finished building the car on the 24th, Jim Clark and Trevor Taylor practiced in the car on the 25th, and ran the race on the 26th! Jim Clark was outpacing everybody with the car, but went off the road overcome by exhaust fumes due to a leaky exhaust system. However, the potential of the car, with the new Twincam engine, was very obvious to all. This article, from Autocar 1st June 1962, is a great summary of development to this point. The old Anglia was treated to a new 1500cc 5 bearing engine, and in July, a new engine was installed in the second Elan prototype. By August 1962, there still wasn’t a production Twincam in sight. A deal had been struck between Lotus and Ford to design and build the Lotus Cortina using the Twincam engine, although nothing had been started, and the London Motorshow was in October, where the new Elan would be launched, with, of course, the Twincam engine. No pressure! Keith Duckworth was given the task of developing the Lotus Cortina engine for group 2 racing, and in so doing, he developed the final shape of the head, and oil-breather arrangement, which were adopted for the production engine as well. In August, when the 1200cc Cortina (in grey) arrived from Ford to be the prototype Lotus Cortina, Bob and Steve lost no time in popping in a 1500 Twincam. It didn’t fit! The inlet manifolds were too long, and there was not enough room for the carburettors to clear the inner wing, so Bob cuts the ends off the inlet tracts until the carburettors did fit, but there was no room (yet) for the airbox. The London Motorshow was now looming, being held for 10 days on the 17th – 27th October. With 2 weeks to go, the Lotus Cortina prototype was running, but the Elan had blown another head gasket, a very common occurrence with the prototype engines. The Elan did make it to the motorshow with a pre-production 1498cc engine, but it wasn’t running and the pop-up headlamps were supported on bits of wood. It was a sensation none the less, and orders came flooding in, for a car which hadn’t started to be built yet. On the 11th October Steve Sanville and Bob Dance went to JAP to debate and eventually sign up the deal for them to make the production engine. JAP produced their first pre-production engine on the 21st October, but it only produced 85bhp, but after stripping and re-building, it was installed in an Elan 1500. After the motorshow, Bob Dance took an Elan to MIRA to conduct fuel consumption tests. 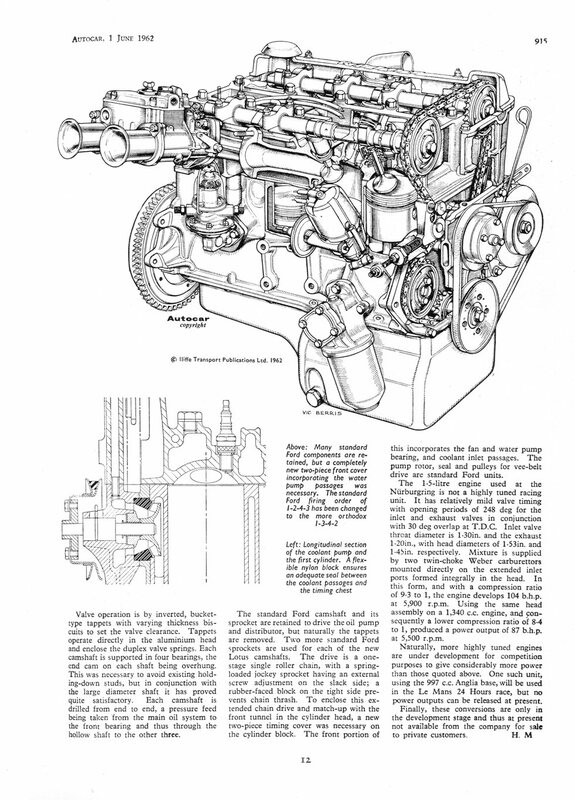 By November, the final length of the inlet tract had been determined, and that would allow both the carburettors and air box to fit in the Elan and the Cortina. At the end of November the graded 116E blocks started to arrive, and by the middle of December, the first 1558cc pre-production engines started to be built at Cheshunt. There were still many occurrences of blown head gaskets though and this took a few more weeks to get sorted out. There were still problems with the sand cast cylinder heads provided by Birmide, pricipally around distortion leading to head gasket failure. Other companies were invited to tender for casting the head, and a new contract was awarded to William Mills in Wednesbury. They had significant experience in die-casting cylinder heads, manufacturing heads for the Jaguar XK engine. Endurance tests were carried out throughout December, and a reliable peek power of 96.2 bhp was achieved. At the beginning of January 1963, things were looking very grim, with no production Elans to sell, the Lotus Cortina still in pre-production development, and no money to fund any further work. But Lotus were to find a way, and the Lotus Cortina was launched at the 4th Racing Car show in Olympia, London Jan 25 – Feb 2nd. William Mills started production of the cylinder heads, and after some initial failures, reliable pre-production engines started to be built. Production engines started to filter though in February 1963 with the first engines fitted to a couple of Lotus Cortinas and Elans at the end of February , and a few more in March. The production Twincam engine was born! But production for both cars was very slow, and didn’t really get going until the middle of the year. However, Villiers, the parent company of JAP, were having some internal problems, and in mid 1963, closed the Tottenham workshops, and transferred the Twincam engine building to their premises in Wolverhampton. This created communication issues between Lotus and Villiers as the Wolverhampton company was heavily unionised, and discussions could only be held formally, peer to peer, which slowed down the introduction of the odd tweek and modification enormously. It also created a tortuous logistical issue, as cylinder heads had to be delivered to Wolverhampton from Wednesbury, short engines delivered from Dagenham, and once the engine had been built, it then had to be delivered to Cheshunt. This increased costs considerably, and slowed down the rectification of quality control issues, further adding to the costs. By 1965, the British motorcycle industry was in a steep decline, and industrial action was considerable. The Villiers group (who owned JAP)was bought by Manganese Bronze, who had previously bought the AJS, Matchless and Norton Group (AMC), and the following rationalisation, plant closure and general unrest caused considerable quality and timing problems in the production of the Twincam engine. And then it gets worse! Lotus moved to Hethel in 1966, and the supply chain became even more stretched. However, The new facilities enabled Lotus to bring the building of the engine in house at last, firstly by machining the heads before they went to Wolverhampton for building (mid 1966), and by August 1967, took the whole machine and build process in-house. JAP, Villiers and Norton Villiers had built some 7100 Twincam engines by then (in 4 years), and a total of 32,600 engines were built by the end of 1975. Lotus built 25,000 engines in 8 years at Hethel.